It's that time of the year. Everyone is hustling and bustling around trying to finish up their Holiday shopping, which is when I realized that I have never done a Holiday Gift Guide on the site...my bad guys. 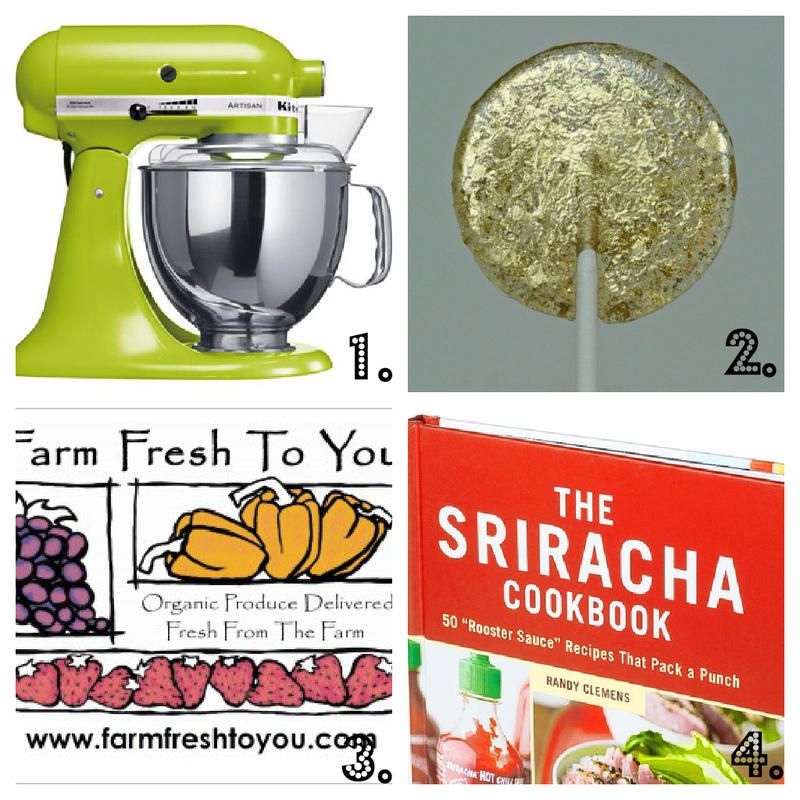 We've created this Holiday Gift Guide specifically for you foodies or for the foodies in your life! Though I'm a foodie, I'm also a baker, so of course I had to include a KitchenAid Mixer (#1) at the top of the Holiday Gift Guide. I got my mixer a few years back and it made my kitchen life a million times easier. You can use it for cookies, breads, batters, frosting, whipping mashed potatoes and even to shred chicken! Don't even get me started on all the attachments...they just add to this little mixer's plethora of uses. Plus, they come in an array of fabulous colors so you're sure to fall in love with one! Your other favorite Chronicles of a Foodie Blogger Lili has turned me on to these amazing gourmet lollipops by The Groovy Baker (#2). These are anything but your ordinary suckers, they've been featured in Martha Stewart Weddings, Real Simple Magazine and Rachel Ray Magazine! With flavors like Alchemy (pictured), Tiramisu, Lavender Honey and Mango Lassi, The Groovy Baker has created the ultimate portable decadent treat! The Groovy Baker creates other baked goods for order but you can find here lolli's at her Etsy shop! Farm Fresh To You (#3) is an Organic Produce Delivery service that brings the farm, fresh to you! (I couldn't resist) I've had some friends at work swear by this company and even Lili loves them! There's a variety of packs to order that feature the best in-season produce. What's even nicer is that they have recipes on their site best suited to all their produce. They also deliver to offices if your work is looking to make a healthy turn! It's easy to sign up and start delivery service on their website here! Last, but certainly not least, I present to you The Sriracha Cook Book (#4). I am a Sriracha fiend. I will put it on, mix it in or eat it with ANYTHING. My favorite way to eat Sriracha has to be mixing it with sour cream for my Mexican food dishes. The recipes in this book takes Sriracha and recreates it into some amazing recipes, such as the Honey-Sriracha Glazed Wings. Also, side note, does anyone know where I can find a mini bottle of this stuff? Yes, I am looking for a mini bottle to keep in my purse so I can have my Sriracha on hand at any time. I told you, I'm addicted. 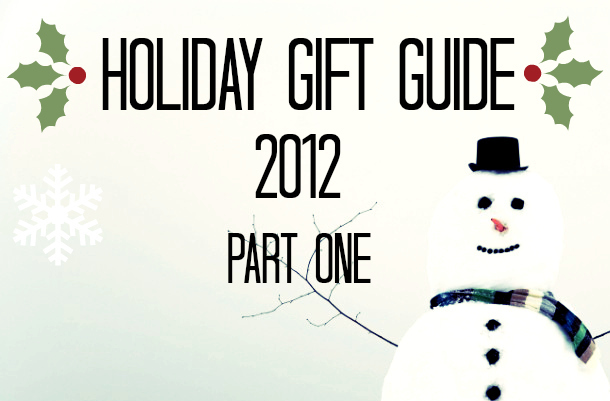 Stay tuned for our Holiday Gift Guide Part Two! wow - when did lollipops get so fancy? Ha! I was JUST thinking the same thing as Jill. Those are the prettiest suckers I've ever seen! My sister is obsessed with her Kitchen Aid mixer...if I knew they came in fancy lime green I might be a baker, too! ;) Stopping by from SITS. That is a cool mixer. Fancy lollipops too!